There have been a bunch of signs that RadioShack-Nissan has been coming apart at the seams. Johan Bruyneel and Frank Schleck clashing, with Bruyneel sending Schleck to the Giro in an apparent attempt to split up Frank and Andy; Frank pulling out of the Giro and trading barbs with Bruyneel through press officers; Bruyneel being a part of the USADA investigation into Lance Armstrong; Jakob Fuglsang’s public displeasure with team management; rumors that RadioShack-Nissan hasn’t been paying some of its riders; and rumors that Kim Anderson is quietly setting up a new team, Alpecin-Trek, to be built around the Schlecks (call it Leopard Part II?). Now, there could be a bunch of reasons for the things listed in the first paragraph – things that armchair commentators aren’t privy to. And it could be that Popovych was, truly, the only rider capable of waiting for Frank, for whatever reason. But put them all together and a compelling story emerges, bound together by an egregious sign of a team that is coming apart at the seams and rife with divisions – abandoning their protected rider during the world’s biggest bike race. This entry was posted in Races, Teams. Bookmark the permalink. In RSN’s defence, they did have Cancellera to protect as well, right? Granted, it only meant one more day in the yellow jersey, but that’s likely one day more than anyone on the squad would be able to muster this year. 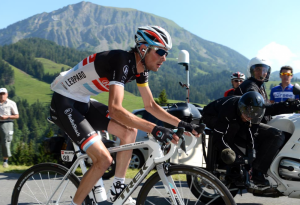 I wouldn’t be shocked if Schleck abandons, though he certainly would be given a long enough leash to go for a stage win or two.